Four make or break stock market developments lay ahead in the next four weeks and the challenge for you has to be when you load up or dump stocks. What I want to do is make it perfectly clear what you have to consider for your portfolio. I’ll tell you how I intend to play it. What the Hayne Royal Commission (RC) report tells us today. How the Government and Labor respond. What the Fed says after the March 20 meeting. Will a viable Trump trade deal materialize with China? These are all vital ‘make or break’ matters for our stock market. You can either bite the bullet now and invest, believing good sense prevails and absolutely clean up, if your faith in politicians and policymakers is well-placed, or you could wait until the end of March. The problem is that you could miss a very big leg up for the local index, if the RC recommendations and the political responses are measured. But this is a hell of a gamble! One interesting issue for Labor’s Bill Shorten to consider has to be if his Party’s response triggers a big fall in financial stocks and then the overall stock market, as well as the dollar. This could be a big political mistake given that he looks a certainty to be our next PM and this could influence him to be less reactionary to the Government’s response. This is entirely speculation, but based on the Labor leader’s committed stands on franking credits and negative gearing, it’s likely he will play the political card for all its worth, which could be a worrying sign for stock players. For the Government’s response, you can bet they will support all the RC’s recommendations that are consumer/voter friendly but maintain a right to worry about the bank lending and economic growth implications of the Commission’s suggestions. It also has to ensure a free flow of loans to stop the house price falls becoming as bad as some newspapers are already hyping it to be! I have to admit that I’m not confident about what the recommendations will say or the political response of Bill Shorten. This means if I go long stocks today and tomorrow then I’m punting not investing. On the other hand, I’m confident that this month the Fed will stick with its promise to show “patience”, despite the huge 304,000 jobs that showed up in the US over January, rather than the economists’ guess of 170,000. Now these guys and gals, who guessed so badly on the job market, make up the same mob who, as a group, put the mocker on the US economy in the December quarter. As you know, my optimism on US stocks has been linked to my belief that the US economy was slowing but only from great growth to good growth. Recession talk was crazy but the world entertains odd people, along with measured, rational types. I also have argued that Donald Trump, though he doesn’t look at home with the rational non-crazies, is a smart operator, who can read a market better than most. Trump knows his market of voters don’t want him to be commander and chief of the USA when it falls into recession and a stock market crash. He has hog-tailed the Fed boss, Jerome Powell, into ‘behaving’ on interest rates. Charlie Aitken says this is the biggest reason why stocks in the US have had the best January since 1987, rising 7.7%! But I slightly disagree with Charlie in arguing that there was a bit of optimism on the trade deal front in that January rise. I watch this stuff daily and good as well as bad news on the trade deal instantly affects stocks. I bet an inked deal on trade, if it happens, will be worth a few percent or more to stocks. Like the RC recommendations today, it would take away another element of uncertainty. In summary, if the RC and the political party responses, as well as the Fed’s rates narrative, along with the trade deal, all work out to the positive, then 2019 will be a good year for stocks. Already in this third year of a US President (which is the best for stocks), we’ve seen a great January. Historically since 1950, 87% of the time, a strong first month has seen the S&P 500 end up as a positive for the year. 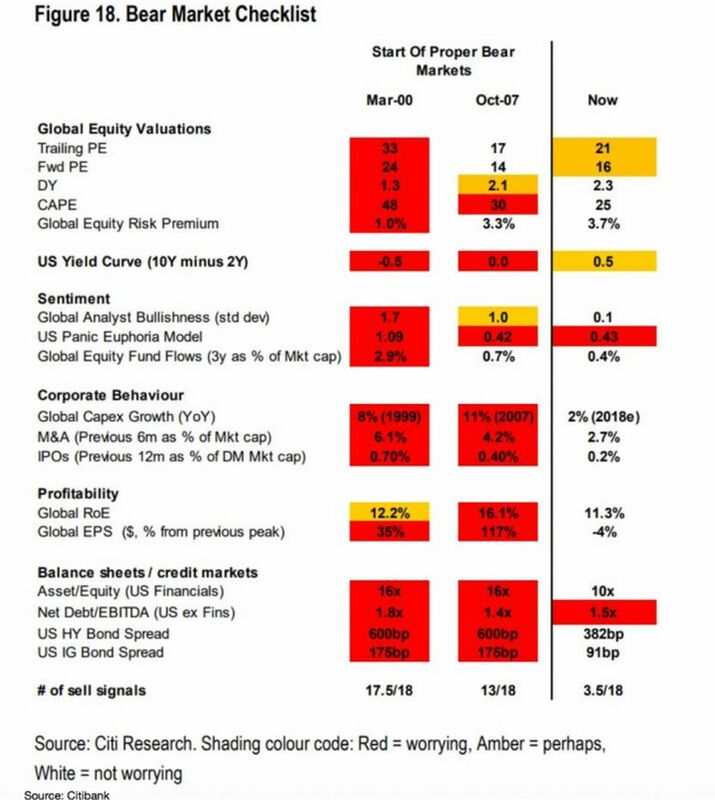 Meanwhile, another important point is Citi’s bear market indicator of 18 red flags. Only 3.5 of these scary developments (out a potential 18) are worrying the research team, who are on a 24/7 watch of these key forewarnings of market disaster ahead. Recall in 2000, ahead of the dotcom stock market crash, 17.5 red flags screamed “get out!” Meanwhile 13/18 were waving red in 2007. And if debt ratings agencies had been doing their job better, maybe the number would’ve been 14 or 15 out of 18! What this tells me is that if you want to punt on these four ‘make or break’ factors for stocks, then at least the other stock market-determining issues out there are playing in your favour.